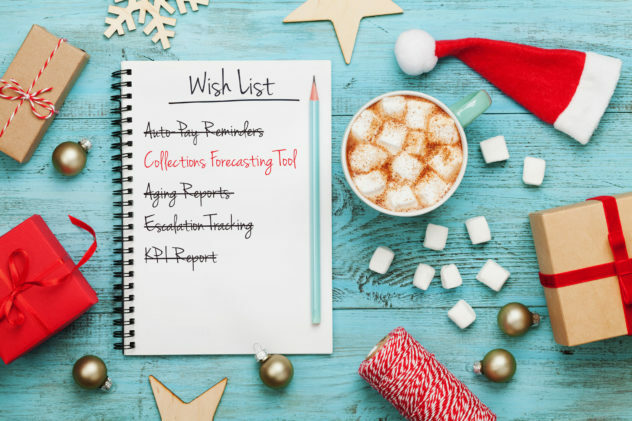 Is a Collections Forecasting Tool on Your Holiday Wish List? Year end is right around the corner — do you have the ability to estimate the collectability of accounts receivable for the remainder of 2017? If not, you may want to put a collections forecasting tool on the holiday wish list from your CFO. Accurate collections forecasting is more important than ever in understanding where your company is financially. Businesses are investing thousands of dollars in forecasting tools that help grasp sales pipeline, expense management and budget. Yet, despite such investments in technology, the forecasting of collections often gets put on the backburner with a claim that it’s just too difficult to capture. Promise to Pay — Transparency with what was communicated during collection communication in regards to Promise to Pay (e.g. what invoices, how much, when, etc.) is crucial. Details such as reason for lateness, dispute specifics, partial pay plan, and amount of promised payment are all crucial reporting elements of any collections strategy, but companies often have difficulty capturing this data, which impacts collections results and customer service. If you don’t have an easy way to capture DSO and Promise to Pay details, collections forecasting becomes too challenging and, ultimately, you can’t get a handle on cash flow. By staying on top of your cash projections with tools like automated collections management, you can better understand where your business is headed financially. Having data that is automatically aggregated and displayed, giving businesses the ability to uncover late payment trends, Promise to Pays, recurring issues, and spotting underlying problems is crucial to providing an accurate collections forecast.